One of my tasks as an intern has been to research and write content articles and artifact descriptions that will appear in the exhibit at the Wornall House opening next fall entitled, “Farmstead to Field Hospital: A Family in the Crossfire of War and Modern-Day Medicine in the Making”. I’m experiencing a total immersion type of education in the history of the Wornall House, Civil War Medicine and the the Battle of Westport. I love my “job.” Ask me anything. One of the things I am working on are newsletter blurbs for publicity and PR. Once such article is on chloroform. There were 1500 casualties after the three day Battle of Westport and the Wornall House became one of six local hospitals to care for the wounded. I am certain surgeons used a lot of chloroform at the Wornall House and, using the creative imagination of an historian, I wrote a blog type of article where 9 year-old Frank Wornall perhaps caught a whiff of that sickly sweet smelling stuff as he tended to the wounded in his home after the battle. The article I wrote was well researched and Jason Roe PhD at the Kansas City Public Library provided expert editing advice. What the article needed to top it off and grab attention was quality photos of a vintage chloroform bottle. But wait, there’s a catch: The Wornall House Museum does not posses any Civil War era medical equipment, has no research library to speak of, and must beg, borrow, and ask permission to use nearly every item they are coming up with for the exhibits…including any photos of chloroform bottles. And…there’s a deadline for the article to make into the April newsletter for the Kansas City Public Library newsletter. Tonight! By 5 pm! I tried to rescue the last minute situation by contacting Clendening Medical Library. They have old chloroform bottles. I’ll drive down there with that high quality digital Nikon camera I bought my wife twelve years ago and take some good pictures my dang self and save the day. I thought about trying to snag our employee, Bethany, from our restaurant for the job. She runs a successful part-time photography business and takes stunning photos. I stopped by the cafe’ on my way downtown and the place was packed. The look on my wife’s face let me know to not even ask to take Bethany away, not even for even a minute. I’d have to take the photos myself. Once I got to Clendening, I had to use all of my Irish charm to get them to walk across the giant rats maze that is KU Medical Center campus and please unlock the cabinet, take out the bottles and let me snap some shots. My charm must have worked. They were very pleasant, cooperative, and even became interested in my project. They even let me take some shots of a pencil drawing of a doctor administering chloroform to a patient. That drawing gave me the willies. I was snapping and clicking away with the camera like Jimmy Olson. I was also blabbering away, schmoozing it up, and piling on my pleasant charms like a used car salesman at one of those we-finance-you-car-lots. And apparently I was not paying any attention to what in the world I was doing with my wife’s over-complicated digital camera. I got back to the the car all excited about my work and pleased with my genius and congeniality in the face of short notice. I scrolled through the pics to see what I got. I swear that I aimed, focused, and pushed the button twenty times on three or four items from several angle. I even heard the click and saw a few flashes. This is the total of what I got. Two photos that look like this. Lesson learned: Some things are better left to the pros. For the upcoming amputation kit photos: I’m going to shanghai Bethany for the job. 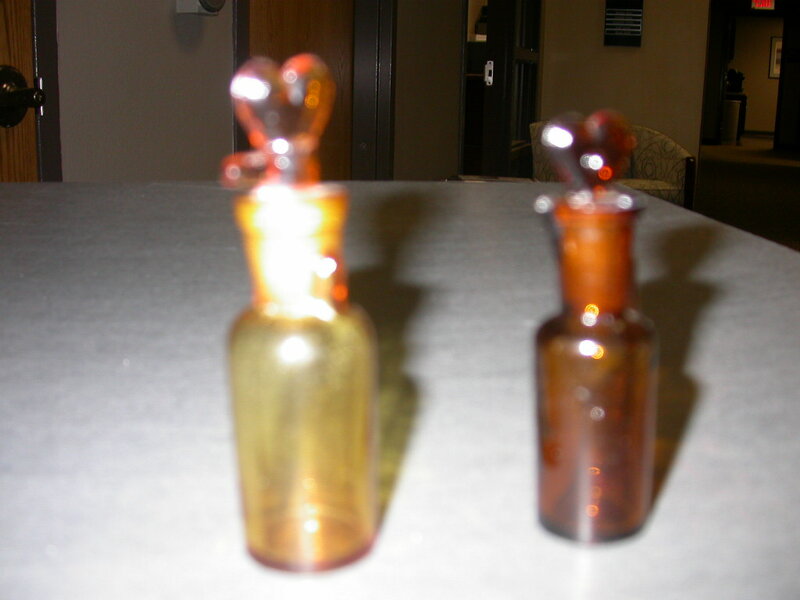 On the bright side, The National Museum of Civil War Medicine e-mailed a couple pictures of chloroform bottles along with permission to use them at about the same time I was taking these lovely shots at Clendening Library. They will accompany the article in the newsletter that you will be able to find here in a week or two. This entry was posted in HistoryMaking and tagged chloroform, Clendening Medical Library and Archives. Tony O'Bryan, Interns, Kansas City, Kansas City Public Library, photography, Tony O'Bryan, Wornall-Majors House on April 13, 2014 by Tony Lawson-O'Bryan.